First we had The Domesday Book of Mammoth Pike, now we have its partner, The Domesday Book of Giant Salmon - a good book, but one which lacks a little of the charm that made its predecessor great, though this is splitting hairs. Even if you pay full price, you cannot claim that you are not getting value for money here; volume I is 480 pages long and a whacking 5 cm thick, while volume II is 3 cm thick and adds another 192 pages. In theory the pair should set you back £85, but if you shop around you should be able to get them both together for something like £55 excluding postage, which is good value in anyone's money. Giant Salmon follows the formula so successfully set by Mammoth Pike and presents a list of salmon weighing over 50 pounds caught on the fly in order of descending weight, only this time, of course, American and Canadian catches are included. 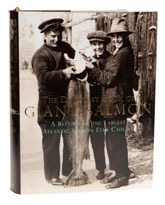 Excluding fish caught on lures is a peculiar decision, especially by comparison with the pike book, where by definition most of the records were caught by any method except a fly, but Fred breaks this rule for fish over 60 pounds, which are listed regardless of the method used. Where possible the story of each catch is illustrated with a photograph of the pool and the captor. As I mentioned above, Giant Salmon is tremendous fun, even if it lacks a little of the spark that Mammoth Pike has - perhaps because there is far less of the thrill of the chase in each account. You can feel the triumph in Fred's pen as he successfully unravels each story in Mammoth Pike and it is completely infectious; in this book some of that sense of achievement is missing and it takes away a little of the gloss, but as a reference work there is absolutely nothing to match it. The illustrations are something of a problem. Mammoth Pike was printed in monochrome and the publishers would have done Fred a favour had they done the same with Giant Salmon, because the standard of the photography is enormously variable, ranging as it does from scans of faded Polaroids taken by lucky anglers twenty years ago, through Fred's own snaps, to a few very smart professional shots. Does it matter? Not really, because the bottom line is that this book would be a classic had it been printed in a pale shade of puse. A word of caution before you buy. Constable printed an American edition, the vast majority of the stock of which - it is a long story - has ended up back in the UK. The American edition was printed a year later than the British one, which was published in 2007, so if such things matter to you and you will settle for no less than the very first edition, you need to check the printing date when you are buying volume I.